British director Andrea Arnold swiftly made a name for herself on the momentum of her successful short films with two intense urban-set dramas, Red Road and Fish Tank, which hit hard on themes of desperation and fury against society's unreasonable despotism. Harsh language and even harsher visuals elevate her works into beautifully challenging visions, often tough to watch but consistently engaging in their coarseness. 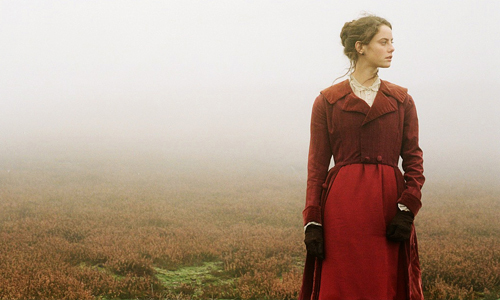 If ever there was a historical costume drama or classic novel adaptation that might fit her modern-leaning perspective, "Wuthering Heights" would fit the bill far closer than most others. Emily Bronte's tale of privilege, oppression, love and resentment in the 1800s comes alive in this brave, bleak portrait from Arnold, stripped down to the essentials and told through nominal dialogue and naturalistic photography. With her focus on internal turmoil, however, also comes an unsympathetic look at the characters and too heavy a focus on unspoken expression, leaving some of the story twirling in the moor's heavy winds. Arnold's perspective on class disparity and internalized rage are what shine here, though, both crucial when exploring the mental and emotional state of Heathcliff (Solomon Glave), a homeless boy who's brought to live at Wuthering Heights by Mr. Earnshaw (Paul Hilton), the land's current owner. From there, this take on Bronte's novel mostly focuses on the earlier years of Heathcliff's life as he navigates the pains of callous treatment from those at the farmhouse, namely the jealously-driven agitation from Mr. Earnshaw's son, Hindley (Lee Shaw), when the lord showed favor to the boy. The jealousy also stems from the quick, unwavering bond built between Heathcliff and Catherine (Shannon Beer), Mr. Earnshaw's daughter, who become inseparable as they hike, explore, and wrestle across the austere moors, appearing to fall in love. The times weren't kind to those who grew sick, however, and death changes the way things operate, to which Heathcliff deals with the situational shifts as a low man on the totem pole who has nowhere else to go. Wuthering Heights and the surrounding moors are adorned with stark skies and aggressive winds that isolate Heathcliff in an effortlessly desperate setting. Arnold reteams with cinematographer Robbie Ryan to attain the grimy, desolate tone of life on the land, where our jostled point-of-view caresses plumes of feathers and dirt caked on faces with entrancing plays on depth of field. Physical and emotional coldness can be felt in every frame overlooking Heathcliff's shoulder, where only the warmth of candlelight occasionally breaks it up. Arnold doesn't shy away from capturing volatile images in that severity either, from physical abuse to frequent -- sometimes necessary, sometimes not -- animal death. Yet, it's rarely without purpose, those provocative images conveying the soberness of Emily Bronte's environment, where a young boy's choices outside of the farmland's relative safety might be slim. Draped in icy, vacant blues and tans in tall grass which cruelly flirt with warmness, this gorgeousness is rife with overcast, creative intentions. Arnold takes an intrepid approach by letting forceful visuals and physical drama command Bronte's story instead of point-blank exposition, where stern glances and body movements between Heathcliff and Cathy take shape as organic flickers of happiness in unforgiving surroundings. The confrontational slant that feels so natural in the director's urban settings plays a crucial role in this adaptation, building a deep-rooted foundation for the homeless boy's treatment -- eventually bordering on slavery -- to develop envy-laced wrath and bitterness. Arnold's fascination with voyeurism, which she eloquently executed in Red Road, also emerges through the boy's envious snooping at Cathy's life through narrow candlelit cracks. These powerful connotations are welcome, but Arnold takes the narrative's capacity to push thematic buttons a bit too far with the curt embellished dialogue, especially in terms of casting a black Heathcliff; the film's vulgarities in that respect add another dimension to what's going on. What's frustrating about Andrea Arnold's approach to Wuthering Heights is that elements of Bronte's story are obscured in raw inference, where certain situations lose their intention by relying too much on forceful performances and naturalistic scene shifts. Elements in this take on the story get their point across quite organically, such as Cathy's shift from spite to adoration of the homeless boy and Heathcliff's rising cold-heartedness and need for retribution. Others, namely more fundamental plot points, rely on assumptions and, in so many words, experience with the story. This feels like a deliberate approach from Arnold to make this Wuthering Heights strictly from the perspective of the here-and-now Heathcliff, and there's plenty to admire behind her intention of making him appear powerless and uninformed. However, these lengthy implicit stretches can also be tiresome when surrounded by a swath of solemnity and ugly human emotion, intensifying as Heathcliff's fixation on Catherine tears people's lives apart. Wuthering Heights' modified adaptation bridges between two time periods within its two-hour span, a gap that Andrea Arnold skillfully handles with well-chosen actors and a graceful evolution of the characters. A straightforward, understated transition featuring Heathcliff arriving at the moors in fine clothing achieves this, his older persona clearly an amalgamation of the person he was and the person he's become. The story's themes of enduring resentment and personal duality come across loud and clear in the similarities and differences between Kaya Scodelario and James Howson to the younger versions of their characters, resulting in a melancholy cataclysm of marriage, death, and children that underscores the narrative's central messages. And with graceful flashbacks to Heathcliff's past as a servant, to happier days when he rolled around in the dirt and listened in on his Catherine, Arnold's flawed but captivating depiction ends on a dreary pinnacle of anguish and anger that fits with the film's burdened tone. Despite its problems, there's weight here.